National Instruments has released the NI Trend Watch 2019 report, examining the most crucial engineering trends and challenges of the changing technology landscape, including the Internet of Things (IoT), the progression of 5G technology from prototyping to commercial deployment and autonomous driving for the masses. 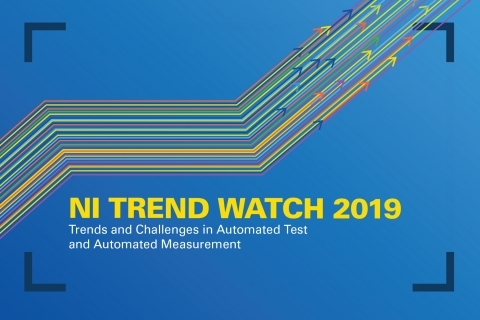 The NI Trend Watch 2019 delves into the following topics to inform and help automated test and automated measurement organizations prepare for the fast-approaching and exciting future of technology. 5G Ushers in a New Era of Wireless Test – 5G wireless devices will be more complex. Engineers must rethink the highly optimized techniques that have been used to test previous generations to enable the viable commercialization of 5G products and solutions. Imminent Trade-Offs for Achieving Autonomous Driving – Autonomous driving could have a major societal impact, but the industry must manage looming cost, technology, and strategy trade-offs as it shifts from single- to multi-sensor advanced driver assistance systems. Keep Pace With a Standardized Development Process – Test engineers are capitalizing on an old trend to keep pace with a quickly modernizing test environment. They are going beyond hardware and software to standardize the process used to build and maintain test architectures. Making the IoT Work for Test – While the IoT is increasing device complexity and, in turn, increasing test complexity, it can also greatly enhance automated test workflows. Multi-Industry Convergence Disrupts Test Strategies – Convergence has potential to speed innovation and deliver products never imagined, but it also severely complicates test. Partnering and learning across industries can result in beneficial perspective on complex test challenges.